On our first free weekend in Seoul, we decided to venture to one of our nearby parks. We hopped on the subway to go to Olympic Park, built when Seoul hosted the 1988 Summer Olympics. When we got off the train, we noticed a disproportionate amount of pre-teen girls in the area; turns out, the show “K-Pop Star”, which we inferred to be similar to American Idol, was auditioning at one of the venues in Olympic Park. So throughout our walk we got to encounter an array of singers, ranging in pleasantness from pretty good to not-so-good. The weather has been cooling down, and on a Saturday the park was full of families out for the day. Many people bring tents to the park to shelter from the sun (and possibly bugs?). Place looked like a regular Hooverville. On our walk we came across four photo sessions. The area was beautiful with huge trees and rolling hills stretching far before hitting a line of city buildings in every directions. One photo shoot was a wedding, with the bride, groom, and wedding party romping barefoot with balloons (half reading I love you, and the other half reading I love Jesus) through one of the fields. 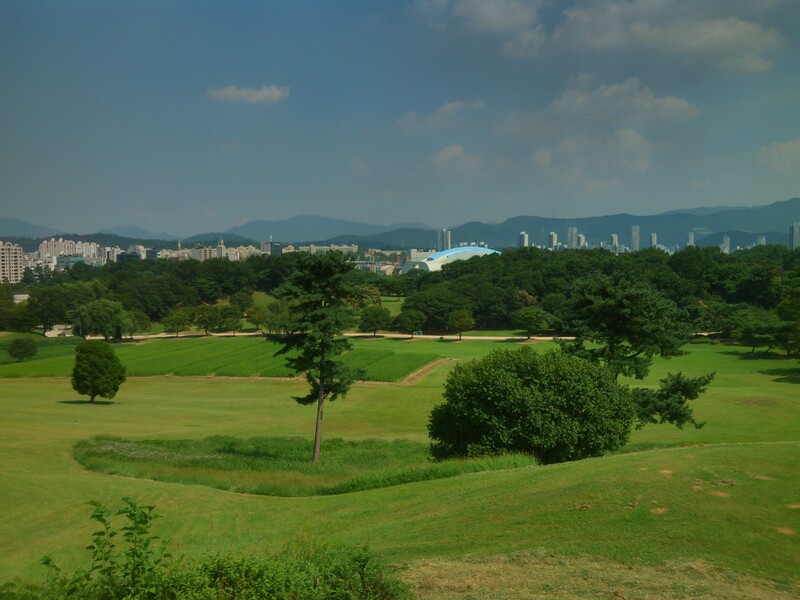 We climbed a hill in the park which gave us beautiful views of mountain-encompassed Seoul. On Saturday night, Ryan’s friend who has been living in Korea for five months now showed us around a few places in Seoul. We got to enjoy some good burgers in Itaewon and drink plenty of (supposedly) formaldehyde-laced Korean beer, Cass. The Cass prognosis: probably no formaldehyde, but the taste doesn’t help its case. Sadly Koreans don’t have a big beer culture, and getting a good beer requires a special trip, a long wait, and deep pockets. The top option for Koreans is the rice-based alcohol, soju, which tastes more or less like a cheap vodka. On Sunday, we ventured to one of the huge Seoul swimming pools in Han River Park. It was the last day the pools were open, so we expected it to be busy, but it was fairly mellow. We went to Jamsil Swimming Pool, which had three huge pools. 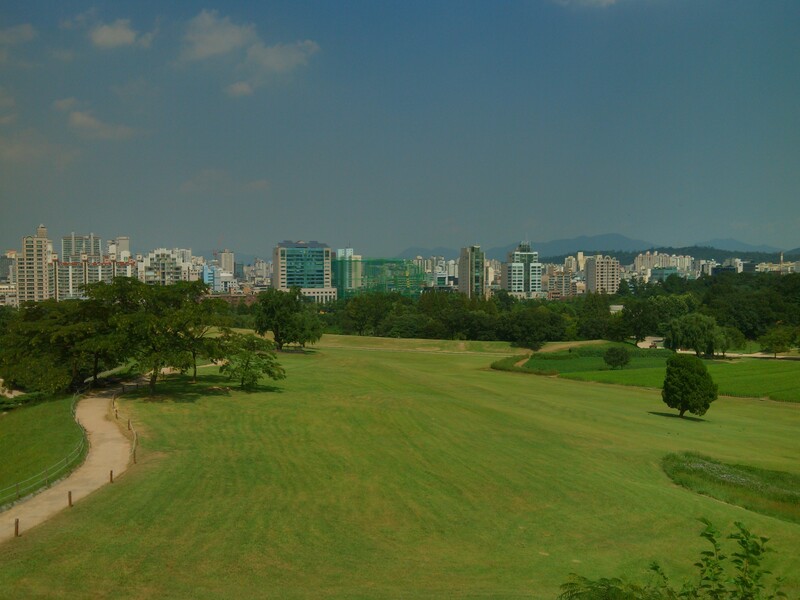 There are five other parks with similar facilities along the Han River, which cuts through Seoul. We enjoyed a dip in the pool before heading out for our first Korean barbecue experience. We went to a restaurant right around the corner from our apartment that is always crowded and ordered Samgyeopsal, which can really only be described as very thick bacon which is grilled to crispy deliciousness at your table. It was served with the ubiquitous kimchi, a variety of salads, soup with something that was either mushroom or gelatin, scrambled eggs, and red bean ice flakes for dessert. And with that we were rested, full, and ready for our first real week of work.